This isn't your grandma's memory match game. Help the lost mermaid find her way home by matching the gems found under the seashells. Watch out for dynamite! It will blow up matching gems and keep you from making the highest score. Pesky pirate skulls will swap rows or columns of gems - now where was that matching piece?!?! Enjoy this memory match game with a twist and master the challenges thrown in at higher levels. Memory match with a twist! 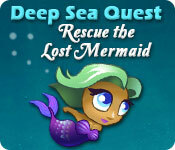 Deep Sea Quest: Rescue the Lost Mermaid is rated 2.0 out of 5 by 7. 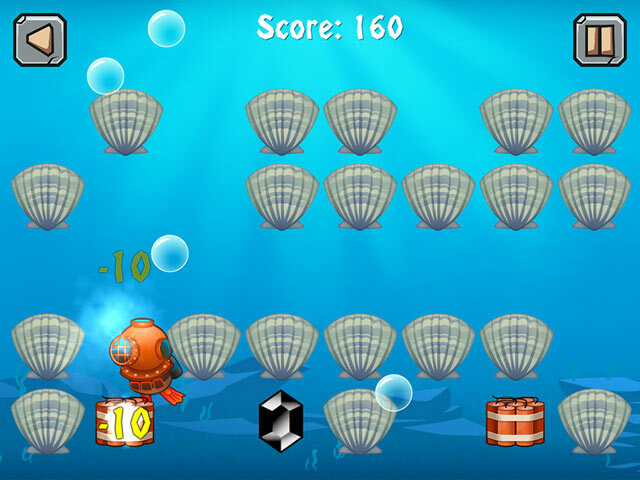 Rated 4 out of 5 by pennmom36 from DEEP SEA QUEST IS A REALLY FUN FAMILY GAME! I can't wait to play this game with my 5 year old granddaughter this weekend. This is a game that will be fun for kids, young and old, and even really, really old kids, like myself lol. My granddaughter is always asking to play one of my games, but I have a hard time finding games she can play, because most of them have a lot of reading involved, especially in HOG's, but this is an easy game to figure out even if they can't read the dialog boxes. When I first started playing the demo, I thought, wow this is far too easy, probably even for the kids. 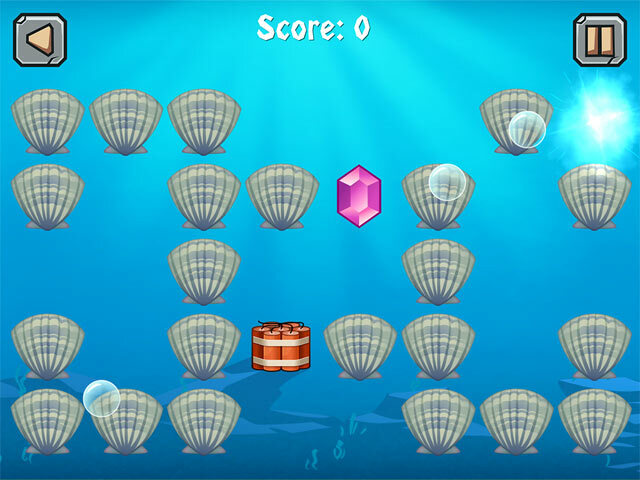 The entire first level (Shallow level) is very easy, and there are only 15-20 large Shells, spaced evenly across the board. All you have to do is click on two different shells, remember which colored gems are under them, and find the matches. You will earn 50 points for each correct match and 200 points when you match the two halves of special items such as diver helmets, various fish and submarines. In the Shallow depth, there are no penalties. In the Medium Depth levels, Dynamite is introduced. The goal is to match the Dynamite with another Dynamite which gives you 50 points, if you click on a dynamite, and then click on one of the speciality halves such as a fish, nothing will happen, if you click on dynamite and then on a colored gem, the dynamite will explode not only that gem, but all gems of that color, even the ones face down, and 10 points are deducted for every gem that explodes. I did find that if you click on a dynamite and a gem on the first move, no points are deducted because you don't have any points to deduct from yet! On the Deep depth, the Pirate Skull is introduced, and he's an annoying little bag of bones! If you fail to match the Pirate Skull with his twin counterpart, all the shells will swap places in either a column or a row, depending on which direction the match was made (if you click on the pirate skull and then click on a shell one row under the pirate skull, those two rows will swap. Matching two Pirate Skulls is worth 50 points as well, incorrect matches will deduct 10 points. Once all shells have been removed, the stats are given as far as the amount of points you earned as well as the number of tries it took you to complete the level. You can replay any level, if you want to try to earn more points, by completing the level in less moves. There is no timer, which would have been a nice option to have, and the points aren't worth anything because there's no Shop to buy Power-up's or Bonuses with. I didn't complete the demo, because I wanted to wait to play it with my granddaughter, but I'm a little leary about the length of the game in its entirety, because it appears that there are only four depths. I'm hoping there are more depths available in the full version because I already unlocked and played three levels in the demo. If you like memory matching games (did you ever play this game as a kid using two decks of playing cards?) and you want to just chillax or play a game the kids will enjoy too, this one is fairly entertaining, and hopefully, it's a longer game than it appears, enjoy! 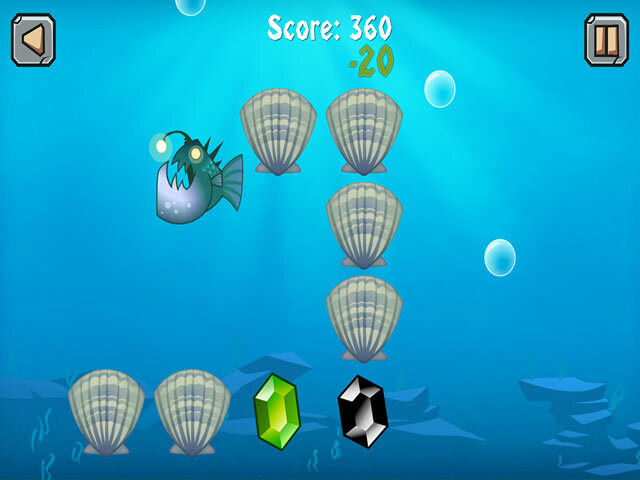 Rated 3 out of 5 by tollermama from Deep sea Quest This game is very very short. I finished the whole thing with 8 minutes to spare in the demo. The game is a memory game where one turns over shells and finds like objects but there are obstacles such as a skull and cross bones that when uncovered and not matched with the other one will scramble your row of shells either vertically or horizontally. There are also dynamites that when uncovered and not paired together will explode whichever object you paired it up with and all the others on the board, detracting from one's score. But who cares what the score is anyway--there is no real incentive here. It is a good game for little kids. It is good for memory and shape recognition. I personally am not someone who cares about "personal bests" with scores. There has to be something else to keep me engaged in a game. I prefer goals such as attaining 3 gold stars, or having a score good enough to build something. This game would be ok for little kids and if you have a freebie. I don't recommend it otherwise unless you like to play over and over again the same game. Try it before you buy it. Rated 2 out of 5 by bwendyh from This game is sunk! Sorry, but the levels were boring and I couldn't motivate myself to go past level 4 or 5. The object is to click on the shells to match what is underneath but really no challenge and no interesting graphics to make you want to continue. Maybe for a younger child. Rated 1 out of 5 by oldladyplaying from Seriously? We're STILL rescuing mermaids (women)??? Could have been cute, minus the fact that WOMEN don't need rescuing anymore! Dev's need to join the 20th century, not to mention the 21st. egads. Rated 1 out of 5 by vernete from for preschool or kindergarten... not a game for me. maybe later in the levels it would get more challenging, or at the least less boring, but i could only playthrough the 7th level of the 'shallows' before i couldn't take it anymore. sorry, but i can not recommend this game. Rated 1 out of 5 by Tflo from A Child's Game! I think young children will enjoy this game but it is definitely not for the rest of us! Not much to say about it. Pick a shell and then a pick another and hope to match them. I thought maybe it would be a good brain exercise but it got boring very quickly!